Located 13 miles (21 km) west of Edinburgh in the Almond Valley between the M8 motorway and the A71 road, Scotland's fourth New Town was formally designated on 17th April 1962. Livingston was formed around three existing settlements; Livingston Village, the site of the parish church, Livingston Station, associated with the railway and oil-shale industry, and Bellsquarry, an agricultural and quarrier hamlet. The Livingston Development Corporation (LDC) was responsible for planning and building the town, defining areas for public facilities, social housing, private and commercial development. However maintaining the town and providing services such as education were the responsibility of Midlothian and West Lothian County Councils. Livingston now extends to 5 miles (8 km) north-south by 4 miles (6.5 km) east-west and covers and area of 10.5 sq. miles (27.1 sq. km), having developed from east to west along the Almond Valley. The town was designed for the car, rather than for railways, although two awkwardly-placed stations did eventually open in the mid-1980s; Livingston North Railway Station and Livingston South Railway Station. A hierarchy of roads define and connect the town's distinct neighbourhoods and link these to the motorway network. The LDC's planning brought roundabouts and grade-separated junctions, rather than traffic lights, to keep traffic flowing, while greenways (a network of paths described as 'fingers of countryside') routed pedestrians away from roads. The preoccupation with the car meant public transport was almost forgotten and roads designed to prevent through-traffic were a problem for the provision of a bus service. Unlike Scotland's earlier New Towns, Livingston's neighbourhoods were not designed with their own shops, schools and churches, rather these were shared or centralised, a potentially efficient strategy but not ideal for community-building, with residents often regarding facilities as inconveniently located, requiring a car journey, or just missing. Originally designed to be a medium-density community, defined as 20-40 dwellings per hectare, its housing changed over the decades from high rises and terraces in the 1960s to 'low density, low rise' in the late 1980s and early 1990s. With houses built to a budget, the Buildings of Scotland (1978) described the architectural style as 'tasteful paternalism'; today many might suggest the architects could have done better. Although the LDC built houses for rent, residents were given a right-to-buy from the beginning and owner-occupation grew to a landmark 50% in 1992. The original Livingston Village, which grew up around the tower-house of Livingston Peel, still contains 18th-C. cottages, a village green and the parish kirk (1732). Other notable buildings include the Almond Valley Heritage Centre, the Old Tollhouse (c.1800), Alderstone House (early 17th C., including parts of an early 16th C. tower), Howden Park Centre next to the 18th-C. mansion Howden House, associated with the family of the painter Sir Henry Raeburn, the dramatic St. Andrew's Roman Catholic Church (1969), the enormous Almondvale Shopping Centre (1976), which effectively forms the town centre, St. John's Hospital (1989), an important regional surgical, maternity and emergency centre, and West Lothian Civic Centre (2009). With local authority boundaries having been redrawn in 1975, Midlothian Council lost its responsibility for the town. The LDC was wound up in 1996 and its responsibilities passed to West Lothian Council. West Lothian College is based in the town, which is also served by five secondary schools; namely Deans Community High School, Inveralmond Community High School, the James Young High School, St. Margaret's Academy and West Calder High School. 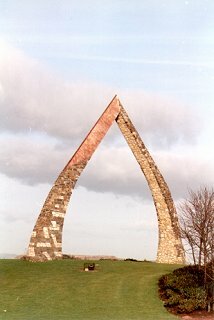 Other landmarks include the enormous Wyman-Gordon forge (former Cameron Iron Works) and the 10-m / 33-foot high Norgate Sculpture, in the form of a whalebone arch, part of the Livingston Landmarks project.